This recipe for my super quick and healthy Turkey San Choy Bow is the perfect weeknight meal, that everyone will love! San Choy Bow (spelt three thousand different ways – I’m talking about you san choi bau and sang choy bow to name just two) is a really light and simple stir-fry. Stir-fries, as a general rule, are waaaaay healthier than they sound. They are also very quick to cook and have all the ingredients required to give your family a not only healthy, but an absolutely delicious meal too, in mere minutes. Heaven to the ears of all those working mums out there, I got ya back. What’s not to love? A good stir fry, doesn’t even require rice and this is one of those. If you love your rice, go for it but San Choy Bow is perfectly satisfying all on it’s own. Just ask my hubby (a rice fiend!) who ate a bowlful of nothing-but for lunch today. Oh, the perks being of a food bloggers hubby, eh? 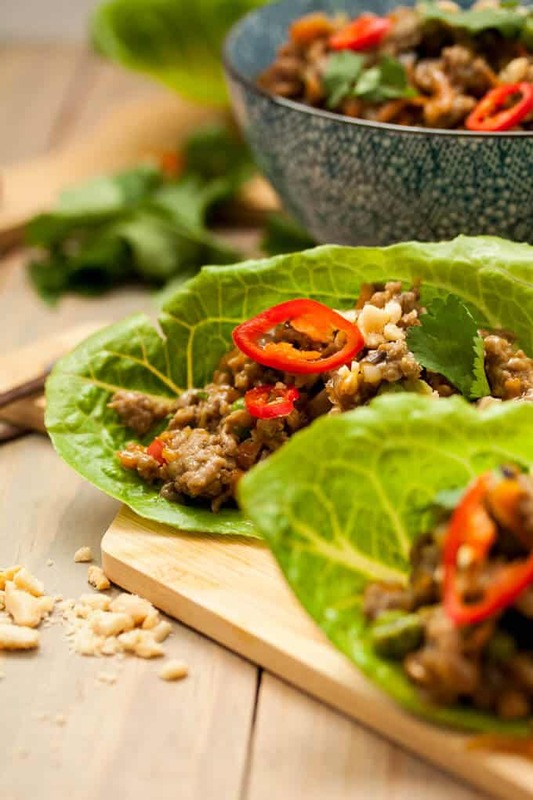 🙂 San Choy Bow is one of those amazing dishes that is both absolutely chock full of flavour and healthy all at once. It’s a good one for kids too because you can cram it full of hidden veggies and they won’t even know. I’ve kicked the healthy up a notch here, using turkey mince instead of the traditional pork mince. San Choy Bow is a fridge-cleaner meal as well, meaning what you’ve got in the fridge right now will likely work just fine. It just keeps getting better, huh? You can use whatever veggies you have on hand. Just chop them all up really small and throw them in. 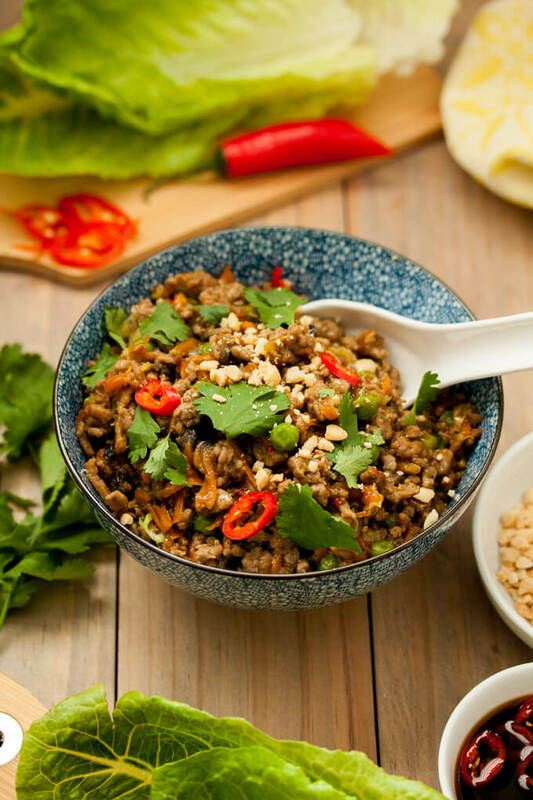 As a general rule, authentic San Choy Bow has pork mince, garlic, onion, water chestnuts, carrot and mushrooms, mixed with a few sauces (mainly oyster sauce or hoisin sauce). Mine has extra vegetables because (during the week, at least) that’s how I roll and I kind of make my own hoisin by using oyster and soy with a little honey. Hoisin is a very sweet, soy-based sauce, but I love oyster so much for the huge flavour punch that I use it regularly in stir-fries and it is perfect for San Choy Bow. I love Asian food. I eat it regularly. When I’m after an Asian cuisine fix, the one I choose depends on my mood. Singaporean is easily my favourite but Japanese and Chinese are right up there too, along with Thai, Korean, Indonesian, Malaysian and more recently Indian. I really love to keep it as authentic as possible so I do have a good selection of Asian ingredients on hand. I make the sauces myself rather than buy pre-made sauces so that it keeps the pantry as tidy as possible. Most Asian sauces are very easy to make from scratch and taste so much better when you do. Many of the savoury dishes I post on here also have an Asian theme, from my Karaage Chicken to my Korean Fried Chicken Wings, Pork Gyoza to the Malaysian Beef Rendang. I love them all. I’ve put together a ‘little’ list of the best Asian ingredients to keep on hand so, if you love Asian food too, but aren’t sure what to stock, here’s an idea of what to keep. Disclaimer; this is by no means a comprehensive list but simply the most important for each cuisine to be able to make something in your own kitchen. So pick the cuisines you love most and have your ingredients at the ready. Pantry ingredients: Coconut milk & cream, water chestnuts, bamboo shoots, water chestnuts, rice (I keep four types but jasmine or basmati will work for most dishes), dry noodles, peanuts, shallots. It sounds like a lot I guess, but reading over that entire list after just typing it out by memory, I stock it all. Every last item above, I’ve got it and use it in day to day meals. It doesn’t take up as much room as it sounds (as there are a lot of repeats) and that means that I can come home any day of the week and have a delicious meal inspired by one of those amazing Asian cuisines, on the table in less than half an hour. All your favourite meals are likely covered by everything above – Tandoori – Done! Teriyaki, Yakitori – Done! Bibimbap – Done! Thai Red Curry – Done! San Choy Bow – Done! Mee Goreng, Nasi Goreng – Done! Stir-fries, noodles, you name it – the above list can do it all! This turned into a longer post than I anticipated but at the very least you can see my passion for Asian food and how easy it can be to make it at home. A lot of my weeknight meals are based on Asian ingredients or Asian style cooking because it’s quick and easy to get on the table but also phenomenally healthy. 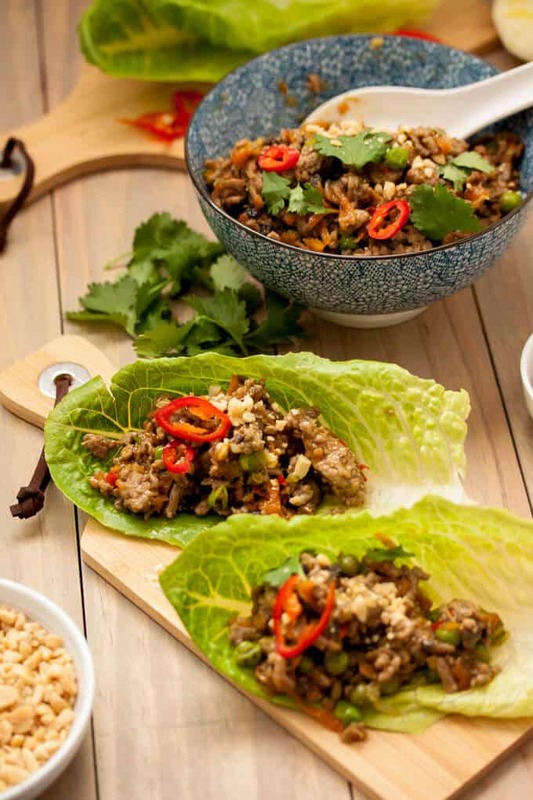 Turkey San Choy Bow makes the perfect quick and healthy weeknight meal that EVERYONE will love! Mix cornflour with a little of the water to make a slurry, then add it together with all of the sauce ingredients and mix well. Heat 1/3 the oil in a wok over high heat. Add the onion, garlic and ginger and cook stirring continually for about a minute. Add the turkey and cook stirring and breaking up the larger chunks as you go, until cooked through. Add the mushrooms. Cook, stirring for 2 minutes. Add the carrot and cabbage and cook, stirring for another 2 minutes until softened. Add in the peas and finely chopped chilli. Cook until the peas are hot and no longer frozen. Give the sauce a quick stir to make sure it’s well mixed then pour it into the wok. Stir through well to coat everything. This bit is really important – now stop stirring. And let the mixture sit over the high heat for about 1-2 minutes. The sauce will get thicker and the mix sitting on the bottom of pan will caramelise just slightly. 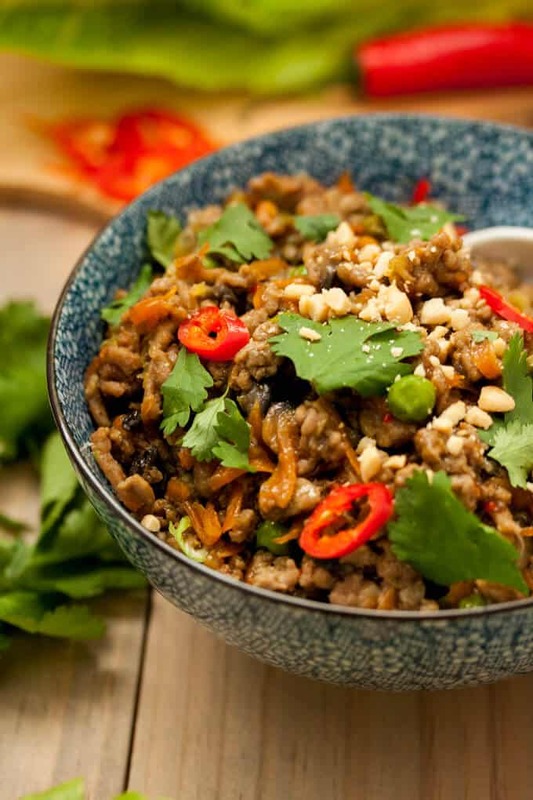 Serve with lettuce leaves, sliced chilli, peanuts and coriander. 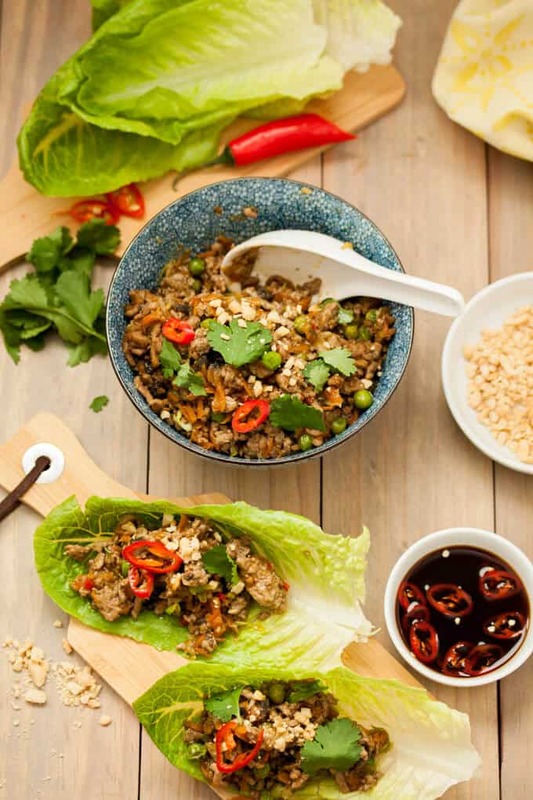 Place about ½ cup of mix into a lettuce leaf, then top with the coriander, peanuts and chilli to taste. Fold up and eat.